For a timeless look that is sure to complement any Melbourne property, why not call Simply Driveways to arrange your new textured concrete driveway? Textured concrete (stencil and slate paving) came to prominence in the late 80’s and 90’s, and almost immediately took the decorative paving world by storm. There was seemingly no driveway that was not done in either of these two styles. These days, even though they have tapered off in popularity, textured concrete can still be effective in certain areas, and certainly here in Melbourne. Both stencil and slate paving come in a huge range of colour and pattern combinations, so no matter the style or colour of your property, there is sure to be something that will suit. Versatile: Textured concrete comes in many colours, patterns and textures, and can mimic a wide range of surfaces including marble, stone and weathered lumber. Aesthetically pleasing: Textured concrete looks great and instantly adds value to any home or property, while having the added advantage of being more budget friendly than the surfaces it aims to mimic. Easy to install: It is far easier to install a textured concrete driveway than a driveway made of pavers. However, it is important to ensure that you have a reputable and experienced contractor for the job, as there is also plenty of room for error. Textured concrete driveways will last for decades if properly maintained, because in some cases it is even harder than standard concrete, due to the finish applied to its surface. This means that textured concrete is even more impervious to scratches and abrasions, as well as penetration of water and other liquids. In order to keep your driveway looking good and to maintain this additional protective barrier, the textured concrete will need to have the colour hardener reapplied over time. Generally maintenance is relatively easy because the sealant inhibits stains, but you should still occasionally wash down the surface of the textured concrete, and sweep it so that you avoid build-up of dirt. Use a high-pressure washer or a scrubbing brush with a mild detergent to keep the surface clean. Once dry, if the surface is starting to lose its sheen, then make sure you reapply a transparent sealant. With over 21 years of experience, Simply Driveways is the expert you need for all aspects of domestic and light commercial concreting, including coloured concrete driveways, textured concrete driveways and exposed aggregate concrete driveways. 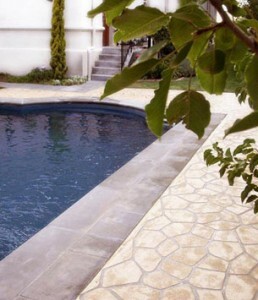 For more information on our textured concrete driveway services in Melbourne, contact us today. With Simply Driveways, you’re guaranteed a driveway that’s simply amazing – every time!